Take three of Britain's top wildlife photographers, any type of weather and some magnificent wild subjects ... welcome to Go Wild with your Camera! With over 2 1/2 hours of exclusive material on two discs this is the most comprehensive guide to wildlife photography ever released on DVD. 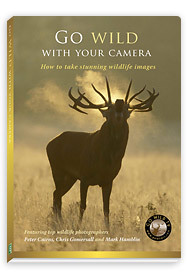 Presented by three of Britain's top wildlife photographers - Peter Cairns, Chris Gomersall and Mark Hamblin - expert and detailed advice is provided through a series of subject case studies filmed in the wild specifically for this DVD. So if you want to take stunning wildlife images either out in the wild or from the comfort of your own back garden this DVD is for you! "Go Wild With Your Camera is a well-filmed, very watchable series of programmes ­ ideal for wildlife photographers just starting out, but with enough variety of subjects, techniques and tips to make them worth watching by serious amateurs." Mammals - join the photographers on location as they track down red deer, red squirrel, badger and brown hare. Birds - practical tips and tricks on how to create beautiful bird images including puffin, garden birds, woodpecker, red grouse, swallow, nightingale and barn owl. Landscapes - uncover the key techniques to capturing sweeping panoramas and cascading rivers.